Image 1 of 25. Click to view fullscreen. Tranquil rural location with mountain views. Free WiFi. FREE WiFi. Set on our 5 ha property in the beautiful Orinoco Valley, and located well off the road and away from the sound of traffic, this very tranquil and well appointed 3 bedroom house, which is extremely family friendly, looks out onto the Mt Arthur Range in the Kahurangi National Park. The house is carpeted throughout, and is tastefully furnished. Aside from 3 double bedrooms, there is also an enclosed sunroom off the lounge with a double sofa bed. Both a High Chair and Portacot are available. In the bathroom there is a large ball and claw bath. There is also a separate shower located in the heated laundry, which also provides both washing machine and dryer. Free to air television, with the choice of 15 channels, is available in both the lounge and dining room, as well as an extensive library of DVDs, including a children interest selection, books, magazines and board games. For outdoor living, the paved patio with tranquil views around the valley has outdoor furniture and a twin plate gas BBQ. The water supply is the purest of spring water, sourced direct from an underground spring. Absolutely no need for bottled drinking water here! In fact we think ours is better. Less than 5 minutes to the Motueka River, just over 15 minutes to Motueka, 35 minutes to Kaiteriteri, Abel Tasman National Park, and Kahurangi National Park walking tracks, 45 minutes to Nelson, and just over an hour to Golden Bay and Nelson Lakes National Park. Excellent trout fishing, picnic spots, swimming, art and craft outlets, vineyards and restaurants are all relatively close by. Numerous bike riding trails, both on and off road. Low traffic volumes in the Motueka Valley area. The Orinoco stream meanders through the property, with picnic sites and safe playing areas for children. Feeding the tame eels is a popular attraction. We have a large hedge maze to challenge your navigational skills, and lose the kids for a short while if you so choose! ‘Meadowbank' Art Studio and Gallery exhibits a visual feast of colourful paintings in all media, etchings, and a number of World of Wearable Art entries. You are welcome to visit. ORINOCO COUNTRY RETREAT IS A TRULY MAGICAL PLACE FOR ALL TO STOP AWHILE. Children charged at adult rate. Babies in bassinettes/portocots only free of charge. During low season from 1/05/10 to 30/11/10 discounts available for stays of a week or more. Smoking is allowed outside only. Together with my wife Anne, we have lived in the Motueka River Valley now for twenty nine years. For many years prior to this we dairy farmed not far from the Waitomo Caves tourist attraction in the North Island. Since living here in the Top of the South I have been involved with the local Information Centre, and then for 6 years until 2003, together with one of our sons, owned and operated one of the major Sea Kayaking companies in the Abel Tasman National Park. Our interests are wide and varied, with a great love of nature the outdoors. This area, with its diverse range of scenery and flora and fauna from the mountains to the sea, has been the perfect place for us to live. The house is located a half km off the road. With the surrounding views and road noise barely audible, the location is exceptional. A great place for kids to explore. Sit on the patio to just the sound of birds and the Orinoco stream. We feel very privileged. Anne is an extremely talented artist, who works in an amazing range of media and styles. She has completed an advanced art degree, and has illustrated a childrens book which has recently been published. She has a studio and gallery on the property which guests are welcome to visit. There is also a large maze consisting of 400m of hedge to test your navigational skills, and a range of fruit available when in season. The bathroom consists of a large ball and claw bath, hand basin & toilet. A separate shower is located in the heated laundry, which has both a washing machine and dryer provided. The very well known Kaiteriteri Beach & Abel Tasman National Park are just 35 minutes drive away. There are also a range of other beaches, including Kina, Rabbit Island, Mapua. Located half a kilometre up our long driveway, and well away from traffic noise, the house not only looks to the mountains, but also across rolling pastoral fields and the Orinoco Stream running by. The house looks onto the Mt Arthur range in the Kahurangi National Park, the second largest National Park in NZ. Extensive range of alpine walking tracks just 35 minutes drive away. There are heaters provided in all rooms, including both the bathroom and laundry. The lounge is provided with a 42" TV and DVD player. There is a selection of over 100 DVD's for your enjoyment, as well as a wide selection of magazines and books. The stove is a 4 plate ceramic top stove with a full sized oven and accompanying trays and baking dishes. A plunger coffee jug is provided. There is a wide range of utensils, sharp knives & bowls etc, as well as a large and comprehensive selection of plates, cups, glasses. The dining room is provided with a table for 4, which can be extended to accommodate 6 persons. There is also a two seater couch and 32" TV. There are TV's in both the lounge and dining room. A wide selection of both magazines and books. The paved patio is provided with garden furniture and the BBQ. With the surrounding views and road noise barely audible the location is exceptional. Listen to just the sound of birds and the stream. Not only is the small garden area well fenced to contain small children, but also the open half Ha (1 acre) field beyond. A safe environment for small family members. The same applies to pets. 100% refund if canceled at least 14 days before arrival date. 50% refund if canceled at least 7 days before arrival date. After travelling around for a couple of weeks, it was wonderful to stay here. We felt very much at home. A great base and a beautiful region to explore. We would love to return. Thanks for sharing your lovely property. The perfect guests. Personable, friendly and responsible. Highly recommended. House has everything you need, lovely setting in countryside and great for kids. Close to all attractions in the area. Lovely relaxing stay. Perfect location, lovely homely bach, wish we could have stayed longer. Thank you. So much to see and do in the local area. Peaceful and stunning location, we loved the maze and the eels, exploring the creek and sitting and listening to the bird life on the outside seating area. The home is very thoughtfully equipped for a comfortable stay, lots of space for a family of six, only wish we could have stayed longer ! Highly recommended. Lovely peaceful place with spectacular mountain view in clear weather. Comfortable bach, which was toasty warm for us on even the coldest winter morning. Nearly got lost in the maze - take some form of navigation aid. Really convenient for Mapua, Motueka, Kaiteriteri / Abel Tasman and Kahurangi. Really enjoyed our stay. 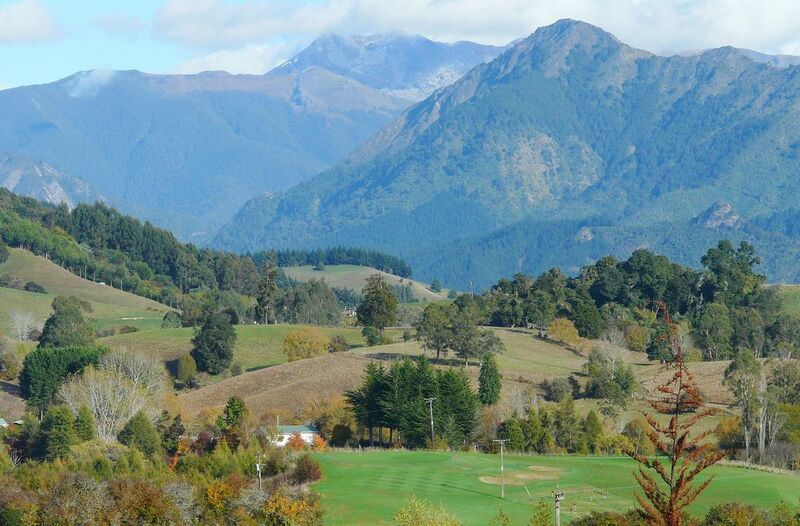 Ngatimoti is a rural settlement just 20 minutes drive from Motueka. It largely consists of lifestyle blocks settled along both the Motueka River and Orinoco Stream. There is also a primary school, two community halls, a very old historic church, a fire station, and a winery and café. In the valley there are a range of pastoral properties, hop gardens, orchards & a large commercial Blueberry enterprise. The Motueka river is considered to be the premier NZ Brown Trout river, and is less than a 5 minute drive away. The river also provides many opportunities for summer swimming, rafting and kayaking. There a several scenic walking tracks within a 10 minute drive, and the choice of alpine tracks and Abel Tasman National Park and Kaiteriteri, offering a range of activity choices within a 35-40 minute drive. Nelson Lakes National Park, an alpine park of considerable beauty is just over an hours drive away.